Researchers new to thermal conductivity measurements are often confused as to why their metal powders exhibit such a low thermal conductivity. 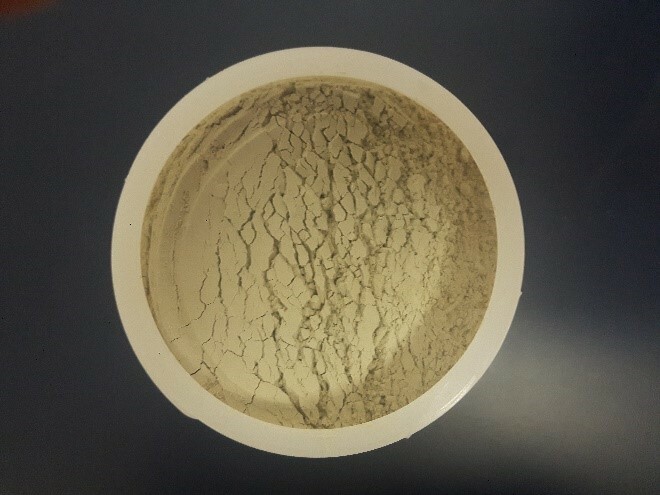 Typically, a researcher will test a powder of a high conductivity metal or ceramic and be alarmed when the value measured is much lower – often by a factor of 100 or more – than originally expected. Why, if the solid material has a thermal conductivity of several hundred W/mK, does the powder test at about 0.1-0.5 W/mK? Shouldn’t it be higher? The answer may surprise you: Such low thermal conductivity of powdered metal is exactly as expected according to the accepted theory of heat transfer in powders! In this blog post, we’ll detail some of the theory on the physics of heat transfer in powders and why powders can be expected to exhibit effective thermal conductivity about 50x to 100x lower than that of the bulk material. As can be seen, a 1mm layer of air in a 1cm copper piece is enough to reduce the effective thermal conductivity by a factor of 100! This dominant effect of air is the fundamental reason why powders so often have effective thermal conductivity that is a small fraction of the bulk thermal conductivity. When you consider that even densely packed powders are typically over 30% air by volume, it’s no wonder the powder can have an effective thermal conductivity which is a fraction of a percent of that of the pure material. Figure 2. A randomly-packed powder with varying particle size. Of course, a powder is more complicated than a sandwich of copper and air: Powders are very complex systems of granular materials with small, but variable particle sizes, in which particles are often distributed randomly (Figure 2). As with the broader category of granular materials, they have two phases, and have properties which may vary depending on packing and volume fraction (density). In powder blends, regional variations in composition may also be present. Furthermore, particle shape and size also influence the overall packing and thermal contact efficiency – and therefore the overall effective heat-transfer properties of the powder. From an engineering standpoint, powders are interesting due to how common they are in various industrial and engineering processes. Some engineers posit that granular materials, including powders, are second only to water in terms of how often they are manipulated by engineering processes. As such, they’ve been the subject of intense study since the 19th century. Despite this intense study, powder physics is a field that remains incompletely understood owing to how complicated the physical interactions are. Early attempts to model effective thermal conductivity of powders treated the powders as a dispersed phase in an air matrix, based on Maxwell’s theory (see the equation above, where λ_s and λ_g are the thermal conductivity of dispersed particles and matrix, respectively, and f_s is the volume fraction of the dispersed phase). Although improvements (by Bruggeman in 1935) have been made, models based on Maxwell’s theory are generally limited by the fact that they do not account for particle morphology or for particle-particle interactions, and therefore are better-suited to materials with volume fraction of solid < 20%. Most powder beds have a much larger volume fraction. Making the situation more complicated is that powder particles are not distributed in the same way all the way. Some maybe be quite lofted, with flaws such as pores or irregular particle sizes causing inhomogeneity in the packing. 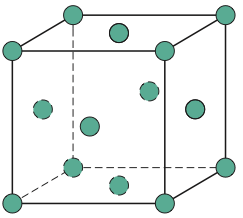 In the ideal situation where particle sizes are regular, there are a few classical modes of packing, such as simple cubic, face centered cubic, body centered cubic, diamond cubic, or Hexagonal Close Packed packing motifs (Figure 2) which may occur. Volume fractions of solid species for regular-packed solid phases of spheres are given in Table 1. More commonly, powder materials are randomly packed. In the case of random packing, volume fraction of the solid component may vary between 54% and 64%. Table 1. Packing fraction for common regular sphere packing motifs. The takeaway of examining the filler fractions of different powder structure is that even the best packed powder is over ¼ air by volume! Given the dominant effect of thermal insulators in a simple one-dimensional heat transfer case, it is no wonder, then, that thermal conductivity of powders is often extremely low compared to the bulk material. That said, given that most powders aren’t spherical in morphology and aren’t regularly packed, how can we predict with better accuracy the effective thermal conductivity of powders? Modern models of powder thermal conductivity generally consider effects of packing, morphology and more advanced ones even consider effects of unequal particle sizes and radiative heat transfer. Case-specific models for certain types of well-understood packing structures exist, but the random case remains difficult to model analytically, and currently research relies heavily on numerical modelling. One of the most advanced numerical models for powder thermal conductivity is the Model of Discrete Resistances by Gusarov and Kovalev, published in 2009. 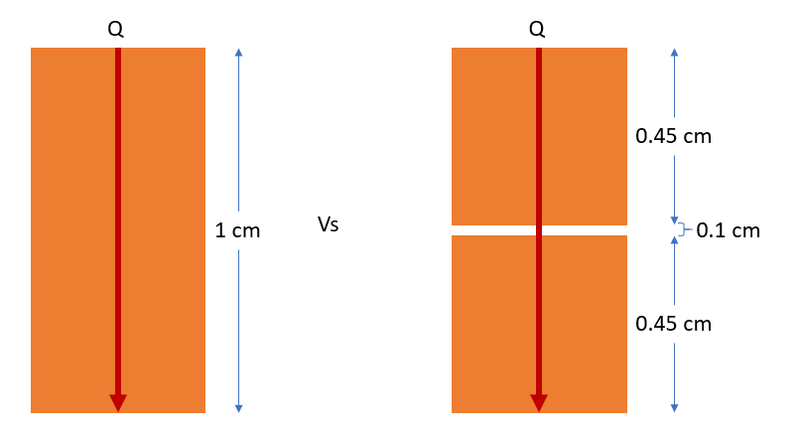 The Model of Discrete Resistances predicts the ratio of powder bed effective thermal conductivity to ambient gas thermal conductivity as a function of the relative size of the surface contact x, the ratio of thermal conductivities of the solid and gas phases λ_s/λ_g , the Knudsen number Kn, and the adiabatic exponent γ. 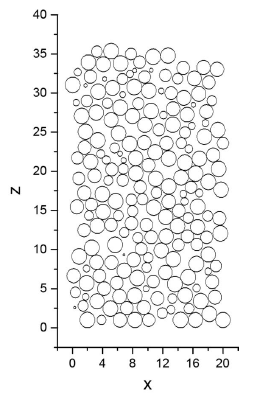 In Figure 3, the ratio of predicted effective thermal conductivity to gas thermal conductivity, λ_e/λ_g is given as a function of filler ratio for various species and mean particle size. 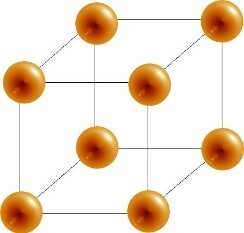 As seen in the diagram – copper with a volume fraction of about 52% and a particle size of about 30μm is predicted to have an effective thermal conductivity of approximately 7x the thermal conductivity of the ambient gas species. If the ambient gas is air (λ_g=0.025 W/mK), this would correspond to an effective thermal conductivity of approximately 0.175 W/mK. Firstly, to avoid affecting the composition of the powder – this is especially important when dealing with moistened or hygroscopic powders, which may experience significant confounding effect from the evaporation of water in the event of a large heat pulse. An excellent solution for measuring the thermal conductivity of powders is the Modified Transient Plane Source (MTPS) method, as it satisfies all of the above concerns, with a temperature pulse of 1-3°C, a flat, top-loading sensor for assuring sample packing uniformity, the Compression Test Accessory to assure representative compression, and a small sample volume – as little as 1.8 mL may be tested. An example of this can be seen in the examination of Ti-6Al-4V. 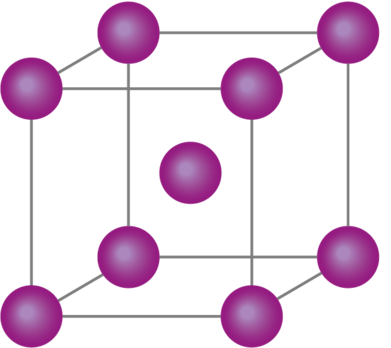 The pure solid has a thermal conductivity of approximately 7.4 W/mK, however, work published by Carrion et al using the MTPS technique[viii] characterized the thermal conductivity of the powdered alloy. 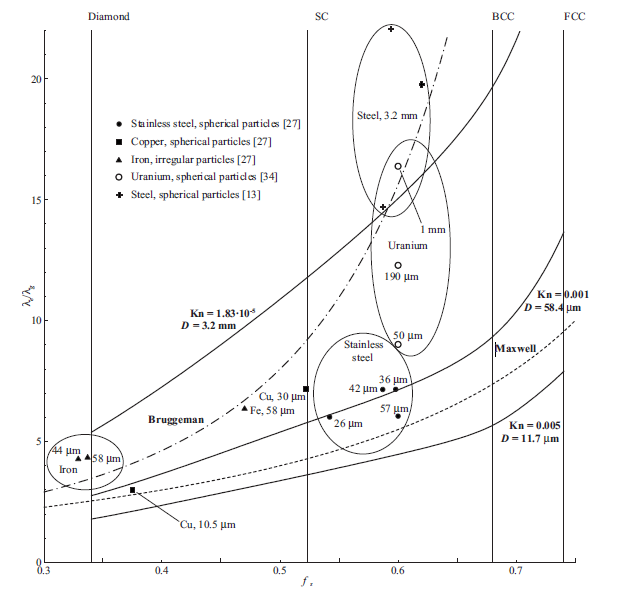 The test results they generated, compared with a typical value for the bulk alloy, are given in Figure 5. As would be expected, the thermal conductivity is over an order of magnitude lower for the powder than it is for the bulk material. Figure 5. 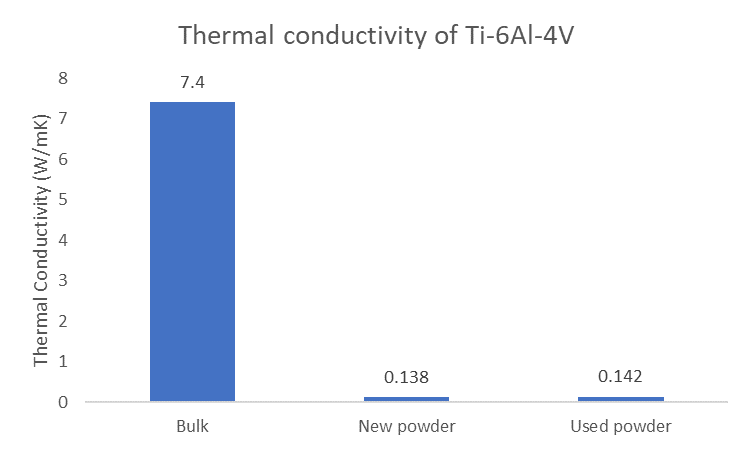 Difference in thermal conductivity between powder and bulk thermal conductivity for Ti-6Al-4V. In conclusion, powder thermal conductivity is a complex function of morphology, particle size, packing, and the efficiency of contacts between adjacent particles. Due to the dominant effect of thermal insulators in thermal systems, the effective thermal conductivity of a powder is typically much lower than the bulk thermal conductivity of the solid. Typical values for effective thermal conductivity of metal powder systems are on the order of 3-25x the thermal conductivity of the gas filling the void fraction of the powder – so, for metal powders in air, thermal conductivity values between 0.075 W/mK and 0.625 W/mK would be reasonable. The effective thermal conductivity of thermally insulating powder materials, such as polymer or aerogel powders, would be expected to be somewhat lower. [ii]B. Harbick, L. Suh, and J. Fong. “Properties of Solids: Closest Packed Structures” Physical & Theoretical Chemistry Chemistry LibreTexts, UC Davis Office of the Provost. 2017. Davis, California. Comment on "Why is the thermal conductivity so low? The effect of interstitial air on the effective k of powders"